Promissory Note forms. Download peace of mind. A promissory note is a written promise from a borrower or “maker” to a lender or “payee” that a certain amount of money will be paid in the future. These documents can be called “notes payable" or even simply "notes". The note can contain additional information such as the date the amount is due and will often contain information on the interest of the debt. On Demand: Payment must be rendered “On Demand” when the lender has requested the payment. Term: At the end of the payment term, the lender will pay the remaining principal and interest in full. Promissory notes can be secured, which means that the lender puts up property as security for repayment. Finally, some notes can also for a Guarantor to guarantee repayment. Once signed, promissory notes are considered enforceable under law and will help protect the payee's rights. For use when demanding payment on a debt including initial and second requests for overdue payment and final demand for payment. Designed to be used when entering into a loan or repayment arrangement to provide additional security in the form of a personal obligation. For use when giving notice that provisions of a promissory note are in default setting forth amount in default and lender's remedies. Promissory Notes Combo Package Get 11 forms for just $39.95. Save 78%! Our very popular Promissory Notes forms together in a convenient packet. At first glance, there’s not much to get about promissory notes. A basic denotative understanding of the construct of the word “promissory” will tell you what you can expect to find in these notes: promises of future action or money owed. But it’s important to understand that a promissory is not as simple as an “IOU,” – instead, it carries a far more substantial binding legal power to it, and it can be used in a variety of ways. 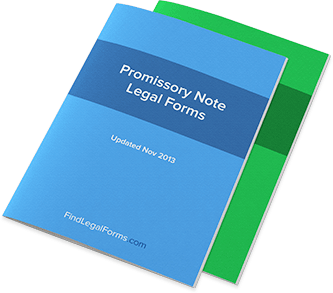 Search through the promissory note forms available here at FindLegalForms.com and you’ll gain a lot of understanding as to how they’re constructed. But if you want to understand them more deeply, keep reading: we’re going to tell you exactly what you need to know about these legal forms so you can start using them in your personal and professional life. There’s an old phrase: “the pen is mightier than the sword.” Most people think this only refers to art, but they forget about the legal power of the written word. Put to writing, agreements suddenly hold the binding power of a contract – proof that two parties agreed to a certain set of terms. Being able to carry a lawsuit to fruition – either settlement or trial – often means having the writing in place to provide a legal grounding for a case. That explains the power of the promissory note. While an IOU could be considered a half-hearted version of the written promissory note, the truth is that real, legal promissory notes are a bit more complicated. Identification of the parties involved. Sure, there’s an “I” in there, and the “U” certainly stands for “you.” But a promissory note will actually define who this “I” and “you” are, giving it much more solid legal grounding. Context and circumstances. Sure, it’s important to have a debt written down, but is that really enough? A good promissory note describes the circumstances that led to the creation of the promissory note, even if that context doesn’t exactly read like the New York Times. If you’re finding out there’s a lot more to promissory notes than you first thought and you’ll never be able to write one, don’t worry. You’ve come to the right place. Much of the problems of an IOU are skirted simply by finding a legal form you can quickly and easily download in order to establish the agreement you want to establish with the other party. We encourage you to search through our promissory note forms here at FindLegalForms.com if you’re interested in signing a promissory note on your own. Having a promissory note that is relevant to the laws of your state and has been crafted by true legal experts is invaluable; you’ll feel much better about your written arrangement in the end. When people hear about the promissory note, they often have a similar reaction: “oh, you mean an IOU.” But there’s a stark difference between a promissory note and an IOU – a difference so stark, in fact, that it could potentially have major consequences for you if you signed one thinking it was the other. To better understand what makes an IOU different from a promissory note, we’ll first have to define exactly what it is that a promissory note does. When you sign an IOU – even if you’re just signing a napkin – the central act that you’re undertaking is to acknowledge the fact that a debt exists. That’s all. The IOU doesn’t come with any specific promise about when the debt will be paid, how it will be paid, or whether or not there will be any interest paid on the debt. Instead, you’re only stating the fact that the debt exists, with few stipulations about the debt itself. For the person receiving the IOU, this can be a good thing, but a promissory note can be much more “ironclad” in terms of collecting on a debt. For many people, a quick glance at these details will bring up the possibility that a promissory note is actually just a loan contract. After all, loan contracts offer similar information. However, a promissory note differs from a loan contract in that there is no loan necessary for the debt to take place; a promissory note might simply be the result of a verbal agreement at first, a debt that was not incurred as a result of a loan. The uses for a promissory note vary greatly. Although many banks issue notes, these are frequently referred to as bank notes and considered a separate document. Instead, promissory notes will typically be used by businesses and individuals with debts to other businesses and individuals. In essence, many promissory notes can actually be used as a form of currency between two parties because holding a note is as good as a promise of exchange of wealth. During the gold standard era in the United States, much of the paper currency was also an indication of what it could be exchanged for in terms of gold – though that’s not to say that the two types of transactions should be considered the same. Understanding the role of the promissory note is, of course, central to being able to use one yourself. But be sure that you fully understand this role before signing one – and remember that it is more legally binding than an IOU often is. What makes promissory notes different than IOUs? A number of things, of course, but one of the most important things to understand is this: an IOU is simply an acknowledgement that a debt exists, while a promissory note includes a more specific promise to make a specific payment by a specific date. While a “promise” might not have a lot of meaning every time it’s used between children, this written promise or agreement in a contract can have a lot of weight when it comes to legal matters. That’s why the term “promissory note” has been interchanged with loan agreements and other contracts - and you’re about to learn why you should always have one written out when someone owes you money. Though they might not sound like ironclad agreements, a promissory note can come in many ironclad forms, and typically they will have the full power of the law behind them. That’s why it’s so important to understand what a promissory note is, what kinds of contracts can be considered promissory notes, and what they typically consist of. For example, a loan agreement can be considered a promissory note, because the person taking out the loan (the borrower) will promise to make specific payments at specific dates, acknowledging that the debt exists. When this is signed by both parties, it becomes the aforementioned promissory note and means that the lender of the money will have a certain amount of legal rights when it comes to making sure the money promised is actually delivered. This is often what happens in foreclosure cases, and the existence of the promissory note is exactly what makes these foreclosure cases with the backing of state and local governments possible. After all, both parties agreed to the promise of money in writing. If you were to loan money to a friend, you should make sure that a promissory note is signed, because if things should go south and your friendship is jeopardized by the defaulting on the loan, at least you will still have the legal authority to ask for the money. Without a promissory note, you are essentially at the “behest of the borrower,” in so many words. They can choose to pay you back or not pay you back. Of course, not paying you back without a promissory notes would have some consequences, like potentially losing your friendship, but if you’ve lent out a lot of money, you’ll want that promissory note so you can legally try to get the money back. Don’t ever loan out money without asking for a promissory note to be signed. It’s what they mean by saying you’ve put something “in writing,” and if you aren’t putting these types of things in writing, then you stand a high risk of losing a lot of money. Instead, fall back on promissory notes - though they might sound relatively innocuous, they can be very powerful legal tools that put the justice system on your side. Promissory notes are easy to understand: they are written promises that money will be paid to someone at a specific time. They’re more specific than IOUs, which simply acknowledge that debt exists, and because of this they are typically more legally-binding contracts. Popular forms of promissory notes in our society include both loan agreements and leases - contracts that promise a payment by a specific date and by a specific number. Of course, a promissory note can come in many forms, as can the payments the promissory notes, um, promise. That means that a payment can come in installments - say, monthly installments as is common in mortgages - term payments, on-demand payments, and balloon payments. In this article, we’ll explore all of these types of payments frequently included in promissory notes. First, let’s look at installment payments. An installment payment is essentially what many people choose to do when they sign a promissory note like a mortgage agreement - they agree to pay the money owed in installments. A monthly installment is a typical type of installment payment that you’ll see, although other arrangements could be worked out on an individual basis. There are also term payments, which typically are tied into a specific length of time. They can also include installment payments, but individual “terms” can see a lot of variability from contract to contract. On demand agreements can mean that something is paid for whenever it is used - think of your “on demand” home movies. You don’t pay for the movies unless you watch them - similarly, an “on demand” payment in a contract can mean that you only pay for something as much as it is used. A balloon payment is made when much of the payments are saved for later in the life of a loan, which means that the interest has made the payments required much larger. The ballooning costs of keeping up with the loan as the interest has made the overall money owed larger is obviously where the term “balloon payment” gets its name. Typically, a balloon payment is a large payment or series of large payments that are paid later on in the life of a loan. Each of these payment options can be included in the writing of a promissory note, which means that the terms of these promissory notes can be flexible. In many cases, however, promissory notes might only refer to mortgage agreements with fixed installment payment terms, or other similarly-predictable payment terms. However, any loan agreement can technically include any type of payment plan that both parties will actually agree to - as long as it is in writing, that is all the legal system really cares about. Is there more to the story? Sure; there are a number of ways that loans can be paid off. The important thing to remember is that a promissory note should include the payment plan that works best for both the borrower and the lender - and whichever boat you find yourself in, that you work to make an accurate an honest promissory note that will leave both parties feeling like they’ve done the right thing.